Automation has enabled explosive growth for Iron Tribe Fitness, which has grown to over 60 franchises with 18,000 customers, and boasts a customer retention rate of 96%. In 2008, Forrest Walden opened his first gym—in his garage. Unable to find a workout facility with the equipment he and his friends wanted to use, Forrest had stumbled upon a real market opportunity. Two years later, he opened the first Iron Tribe Fitness location in Homewood, Alabama. As it turned out, Forrest wasn't the only fitness enthusiast looking for a new kind of gym. With membership limited to 300 individuals per location, Iron Tribe Fitness was able to quickly attract customers looking for an intimate workout experience. Forrest saw an opportunity to expand. Jim Cavale, Forrest's business partner and the current president of Iron Tribe Fitness, soon entered the scene to co-open additional locations. Success came quickly, but Jim and Forrest knew they could be doing even more. Though plenty of leads were coming through offline channels, they were not being cultivated. How much more could Iron Tribe achieve if they could scale their initial success? "Iron Tribe Fitness was enjoying a positive response to its advertisements in everything from local print publications to radio, television, and billboards. With so many leads coming through their actual doors, Iron Tribe Fitness needed a way to follow up virtually. "We had to manage these leads, keep retention high, [and] engage with them," explains Jim. But making calls, asking for referrals, and providing useful information to every customer would require ramping up sales staff and spending even more hours working each week—unless, of course, there was a way to do it automatically. What was required, in Jim's words, was a "paradigm shift." The Iron Tribe Fitness team realized that marketing automation was the missing link. "Today," says Jim, "marketing lives at the forefront of our business model." Since the business implemented the Infusionsoft platform, it has grown to over 18,000 members with additional locations slated to open throughout markets across the United States. Infusionsoft web forms are a key part of Iron Tribe Fitness's lead capturing strategy. From being embedded on 'contact us' pages to being used in display advertisements, the forms have been vital in generating new leads; lead capture has risen by 308%. 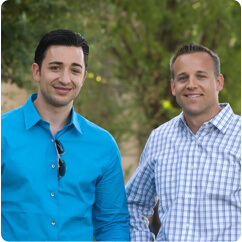 Once Iron Tribe Fitness captures leads, they are automatically assigned to a sales rep. Reps use sales scripts, pre-built email templates, and other tools in their Infusionsoft app to try and close the sale. To nurture leads who are not buyer-ready, Iron Tribe Fitness follows an email sequence that educates the prospect about the fundamentals of their program. "All of our marketing flows through the web and ultimately through our Infusionsoft database, which is divided strategically between each of our locations via contact assignments set in the user permissions," explains Jim. Iron Tribe Fitness has not lost the personal touch that made the company so appealing to its customers in the first place. Depending on their location and the information entered within each web form, prospects receive custom promotional materials that speak to their unique needs. On the back end, APIs allow Iron Tribe Fitness to sync with third-party billing software for seamless data flow between systems. Their profitable, replicable system appeals to more than just prospective gym members; Iron Tribe Fitness has sold over 60 franchises to date. "Infusionsoft has allowed us to scale our business model for the average operator to have the ability to run an Iron Tribe Fitness location, preserving our sales and marketing workflow to a degree that consistently brings in leads," says Jim. Accordingly, the Iron Tribe Fitness team has seen a 3x increase in net profit—and shows no signs of slowing down.